This recital has been a wonderful way of bringing live music to all the children in the school. Very well done to all the performers. Journey into Sound is an adaptable, interactive workshop designed to thrill children of all ages, abilities and needs, from primary and secondary schools to SEN schools and paediatric wards. All the performers are experienced so they are able to be flexible; the workshop is tailored to the situation we are in on the day and the children that are taking part. Skilled, CRB checked musicians bring live music to children in different communities to teach them about a variety of instruments and musical genres from Baroque to modern film and TV music. Each performer is from a different instrumental family to give as wide an experience as possible. Our aim is to increase every child’s appreciation of music and, where appropriate, to encourage them to try a musical instrument for themselves. All our workshops include fun rhythm and singing games so that each child takes part in the workshop. We also encourage class teachers to participate as the activities act as In Service Training (INSET) for staff. There are many added benefits to a Journey into Sound workshop including increased confidence, motor skills and imagination. We are also able to help with lesson spin offs such as art projects related to the workshop. Please do get in touch to discuss Journey into Sound further and let us know your individual requirements. We are able to give reductions in the cost for multiple schools in the same area who are booking a workshop and will endeavour to help you to this end. 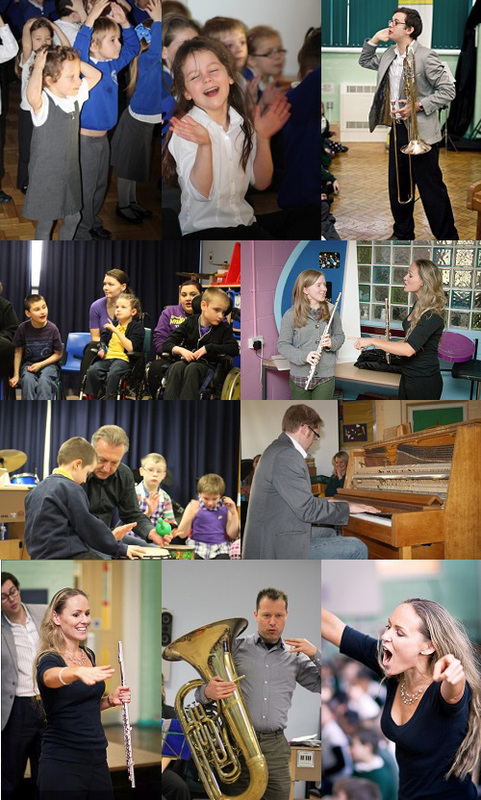 There is no better way of encouraging children to learn an instrument than to see first hand others enjoying it. My son loved the pizza song especially. Fantastic feedback from the children and teachers. Lots of excited new instrumentalists in the making!